1law4all > Racism – Vote No! Maori Council Wards – Vote No! 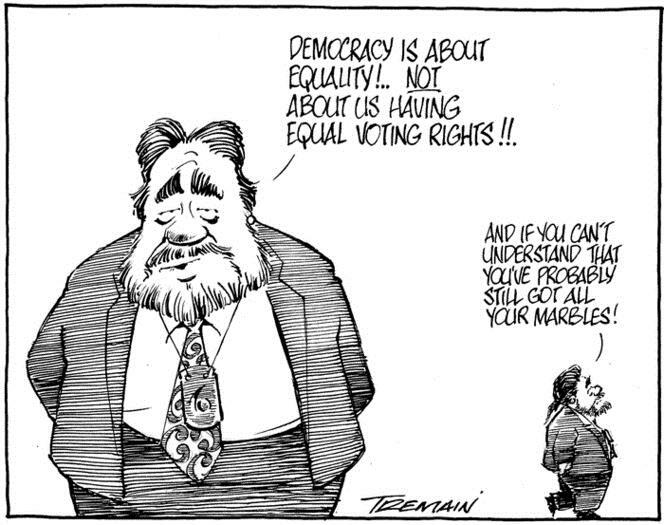 Yes, part-Maori-voters-only wards are another step towards a unique, New Zealand form of apartheid. One which increasingly gives special legal privileges and rights to part-Maoris. Rights which are not available to other citizens, even though they all pay the same taxes and Rates. The expression “part-M aori” is used deliberately here, as the Maoris of the tribes which signed the Treaty at Waitangi in 1840 no longer exist. There are likely few who could even claim to be half-Maori. Through inter-marriage, all those who today benefit from special race-based privileges for part-Maori have more European blood in them than Maori blood. So it makes no sense at all, at this late stage in the 21st century, to be giving modern-day part-Maori special rights based on their ‘maoriness.’ Especially when they are ethnically more European than Maori. The core functions of councils are to keep the roads tidy, provide parks and reserves, sports and cultural facilities, libraries, clean drinking water, sewerage, etc. It is not the function of councils to introduce a form of apartheid into their areas – as the councils of Palmerston North, Manawatu, Western Bay of Plenty, Whakatane and Kaikoura – have recently tried to do. Under present law*, when a council votes to change the voting eligibility and democratic rights of Ratepayers by creating (so-called) Maori wards, that decision can be overturned by Ratepayers in a binding vote. That is what happened in New Plymouth when the then rabidly racist mayor, Andrew Judd, coerced his council by 7 votes to 6, to establish Maori wards in 2015. In protest, Cr. John McLeod, a former soldier, quit his council seat on the spot. The decision was quashed by a public-initiated referendum which saw 83 percent of the 25,000 votes cast against the proposal for race-based representation. As a consequence, Mayor Judd became an unpopular, one-term wonder who did not stand for re-election as he had proved himself so out of touch with public perspective on the importance of democracy. The current first-term mayor of Palmerston North, Grant Smith, could well be poised to do the same. How dare Ratepayers cling to the status quo of the lifeline of exercising their democratic rights! As for “politics of division,” who’s kidding who? It was a pro-race-based-voting-wards Mayor who set out to divide Ratepayers, based on race! He created the division by abandoning the one person one vote cornerstone of democracy. If ever there was a case of the pot calling the kettle black, Mayor Smith would have to be it. He abysmally failed Ratepayers and democracy, then took the side of racial privilege for part-Maori – all against the interests of Ratepayers in general. In so doing, Grant Smith seems to be putting himself on the Judd track to political oblivion. The mayors of the other four municipalities stand charged with the same appallingly bad judgement but not quite to the same degree. Rates bills will almost certainly go up to pay for all the demands that these racially-selected part-Maori representatives would make. Mostly things that benefit or enrich their own group such as grants to haka groups and no end of other special “Maori” projects. Projects and grants which will be of no benefit to the rest of the Ratepayers. A prime example is the Auckland Council’s Maori Statutory Board, set up when the Auckland “super-city” was started. They promptly presented to Council a wish-list amounting to $295 million for specifically “Maori” projects that all Auckland Ratepayers must pay for. That’s what will happen everywhere that Councils have voting Wards that favour one race over another, instead of treating all Ratepayers as equals. 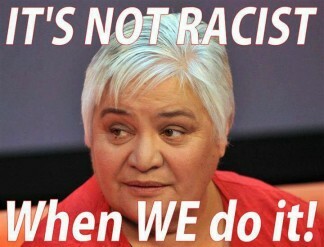 The results in New Plymouth and many other council areas indicate that this separatist and very expensive exercise in racial favouritism by councillors will be voted down by the Ratepayers. The very people who would have to pay for it and keep paying – and long after their present bunch of blinkered councillors and mayors have gone. Palmerston North Councillors were told that the cost of a poll was “likely to exceed $100,000, for which there is no provision in the council’s current budget”. Had the various pro-racial preference councils consulted Ratepayers at the next election, the cost-saving would be huge. 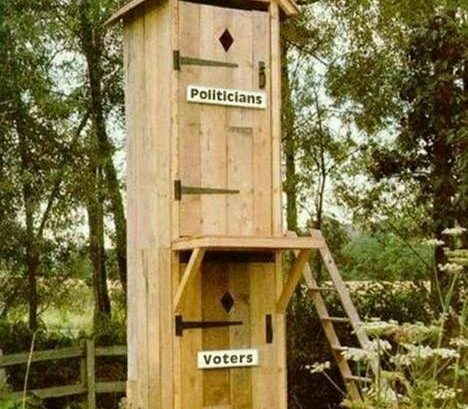 But by making the decision arbitrarily, those same councils have cost their Ratepayers tens if not hundreds of thousands of dollars to have a poll that should have been done “on the cheap” before the decision was made. Don’t Worry – It’s O.K. Apart from the tribal elite and their racist lackeys in government and on councils, the overwhelming majority of New Zealanders want rights to be based on citizenship and not race. We should all be one – which is why (so-called) Maori wards are so repugnant and unacceptable. This is not a that race versus this race matter. It’s a democracy versus apartheid matter. Many of the people who signed the petition to have Ratepayers vote on this issue were part-Maoris themselves. Presumably they are sick and tired of seeing the pale-faced tribal elite using “Maori” for the purpose of enriching themselves. People like the one-sixteenth part-Maori-of-convenience, Stephen (alias Tipene) O’Regan, who has made himself a multi-millionaire out of the Treaty pseudo-grievance gravy-train industry. There are already over 100 pieces of legislation which give part-Maoris special privileges over and above other citizens. Most of these laws have been introduced by shameless politicians trying to buy the votes in Parliament of the race-based Maori Party, or the Maori electorates, etc. However, the Local Electoral Act 2001 allows for Ratepayers to vote on the introduction of Maori wards. The Act provides a rare occasion for citizens – not the politicians or councillors – to have their democratic say-so. To vote whether or not they want the country to continue its perilous slide towards a New Zealand form of apartheid. To vote whether or not we should all have the same rights – as in other 21st century democracies. Maori wards are a retrograde step and deserve to be voted down. Please vote for One New Zealand and vote NO to a racially divided and fragmented New Zealand. 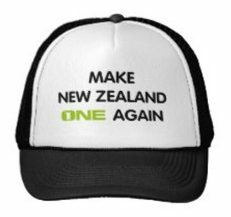 Make New Zealand One again! * Under the Local Electoral Act 2001 (s. 19ZA to 19ZG) when a council attempts to force racial, part-Maori wards in their area, that decision can be overturned by a majority of Ratepayers voting against it.